This fact sheet provides information on transient ischaemic attacks. This fact sheet provides information on transient ischaemic attacks (TIAs). Our fact sheets are designed as general introductions to each subject and are intended to be concise. Sources of further support and more detailed information are listed in the Useful contacts section below. Each person is affected differently by TIAs and you should speak with your doctor or specialist for individual advice. TIA stands for transient ischaemic attack. It is a temporary disruption in the blood supply to the brain. Transient means temporary and ischaemia is the medical term for an inadequate supply of blood. TIAs are caused by a blockage in one of the arteries (blood vessels) supplying the brain with blood. Usually, the blockage is a blood clot. The brain depends on a supply of blood for the oxygen and nutrients it requires to function properly. When the blood supply is disrupted, brain cells are starved of oxygen and nutrients. This can cause damage to the brain tissue. With TIAs, the clot dissolves and the blood supply resumes before any permanent damage is caused. TIAs are linked to stroke and are sometimes referred to as mini strokes. TIAs are a warning sign that you are at risk of a stroke and should not be ignored. TIAs can affect people of any age but are more common in older people. The onset of TIA symptoms is usually sudden. Each person is affected differently by TIA and individual symptoms depend on which parts of the brain are affected and for what specific functions these parts of the brain are responsible. A TIA is temporary and people make a full recovery within a short period of time. The length of TIAs differs for individuals but symptoms do not last more than 24 hours. Some people might have more than one TIA and it is possible to have several TIAs in a short space of time (for example, several TIAs within a day). Most TIAs happen as a result of the thickening or narrowing of arteries that carry blood to the brain. Our arteries tend to harden, narrow and weaken as we get older however there are some groups of people who are at an increased risk. These include people with high blood pressure, people with high cholesterol, people with heart disease or diabetes (or a family history of heart disease or diabetes), people who smoke, people with a high alcohol intake and people who do not exercise regularly. TIAs are caused by blockages (usually blood clots) in one of the arteries supplying the brain. 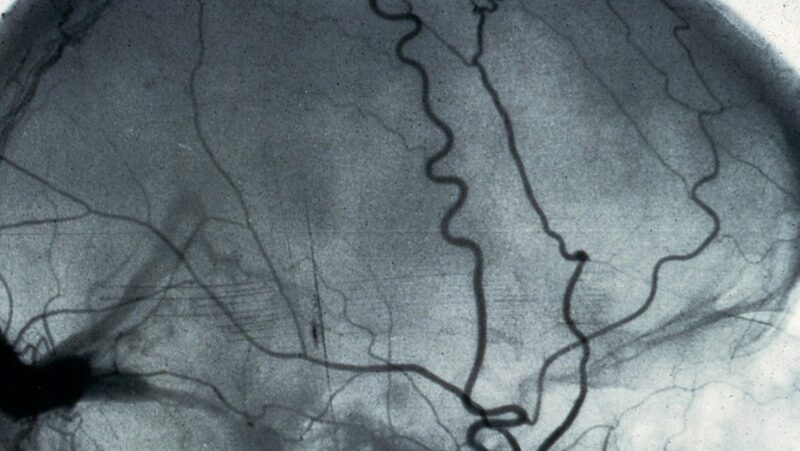 Clots can form in these arteries themselves or form in a blood vessel elsewhere in the body and travel to the brain. Clots commonly form where arteries have narrowed due to a build-up of fatty deposits (cholesterol) on their inner walls. The narrowing or furring of the arteries is called atherosclerosis. Although TIAs affect the brain and not the heart, people with an irregular heartbeat (atrial fibrillation) are at an increased risk. An irregular heartbeat can allow blood clots to form which can then travel to the brain and cause a TIA. The key test for TIA is a brain scan. You might have a CT (computerised tomography) scan or an MRI (magnetic resonance imaging) scan. You might also have an ultrasound test to check for any blockages in the main arteries in your neck which supply your brain with blood (the carotid arteries). Your blood pressure will be checked, you will have blood tests to check your cholesterol and glucose levels, and other tests to check your heart. People who have had a TIA are at an increased risk of having a stroke so it is important to try to reduce this risk. You might be given medication to thin your blood to make it less sticky to reduce your risk of blood clots. You might be prescribed an antiplatelet medicine like aspirin, which reduces the stickiness of platelets and therefore reduces the chance of a blood clot forming. Or you might be given an anticoagulant, such as warfarin, which works by interrupting the chemical process that allows a blood clot to form. If you have high blood pressure or high cholesterol you will be given medication to reduce and control your levels. There are several types of medication that help control blood pressure and most people take more than one type. Medication will always be tailored to your needs and to what suits you best. If you have high blood cholesterol statins might be prescribed. These prevent cholesterol production which reduces the chance of blood clots forming. Stopping smoking and eating a healthy balanced diet are two things you can do to help improve your blood pressure and cholesterol levels. If you have a partial blockage in your carotid arteries you might benefit from surgery to clear it. This operation is called a carotid endarterectomy. Your doctors will discuss your suitability for this procedure with you. How can I reduce my risk of having a TIA or stroke? Support and information on stroke. Support and information for younger people affected by stroke. Medical advice and information on health services. This information was last checked in September 2016. Due for review in September 2019.